Belarusian pagan folk metal band from Minsk Лютавер’е (Lutavierje) has just released its debut full-length album “Песні Налітых Хмараў – Songs of Poured Clouds“. The band was formed in 2006 and next year recorded the EP “Рось“, which was released in 2010 as a split tape with Яр (Jar) via A.F.M. Productions and Werewolf Promotion. The band is preparing its debut album since 2009, but due to several line-up changes it was finally released in the end of December 2012 via Russian label SoundAge Productions. Lutavierje reveal their serious intentions from the very first moments of their album. They have very good production, with rich and mature sound, especially if you take into consideration this is their first work. They play melodic folk pagan metal, combining beautiful guitars and traditional instruments with wonderful female vocals, male vocals and choirs. Their guitars have equally melodic and rhythmic role in their music, following traditional Belarusian tunes and scales, in perfect balance with their folk instruments. They use violins, bagpipes and flutes among other acoustic instruments, adding more complexity and depth in their sound. Tatsiana’s vocals are perfect for this kind of music, being soft, ethereal, folkish and sometimes almost operatic, always with a wonderful “color” in her voice. Some brutal, but not too extreme death metal growls, few clean male vocals and some polyphonic choirs, make their compositions even more interesting. The band has done a remarkable work in all vocal styles and I find this their strong “card”. Aleksandra Shaiko, vocalist of the band Unia, contributes her wonderful folk vocals to the closing track “Падай, Ярыла!“. Everything is in their native language and their lyrics deal with nature and pagan themes. They also include English translation in the CD booklet. 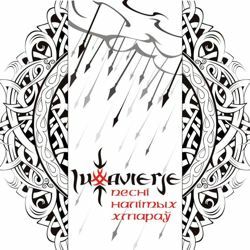 “Песні Налітых Хмараў – Songs of Poured Clouds“ is another fine example of Slavonic pagan folk metal. Maybe it lacks “originality”, since this genre is overcrowded, but at least Lutavierje offer quality music. The album contains 9 songs, lasting a little over 36 minutes and is released in standard jewel case edition via SoundAge Productions. The CD includes a beautiful 8-page booklet, with very interesting and unusual illustrations. In their official pages below you can listen to many of their songs and get a taste of their music.